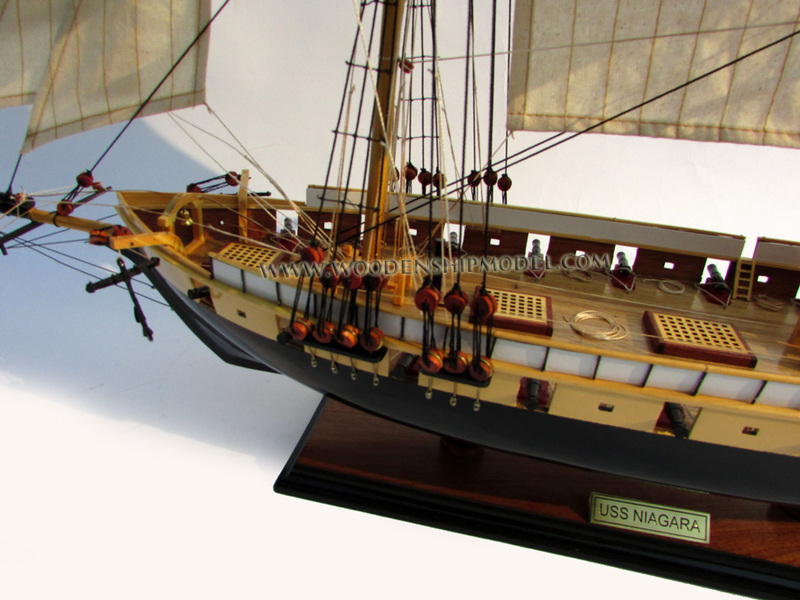 The US Brig Niagara or the Flagship Niagara, is a wooden-hulled brig that served as the relief flagship for Oliver Hazard Perry in the Battle of Lake Erie during the War of 1812. 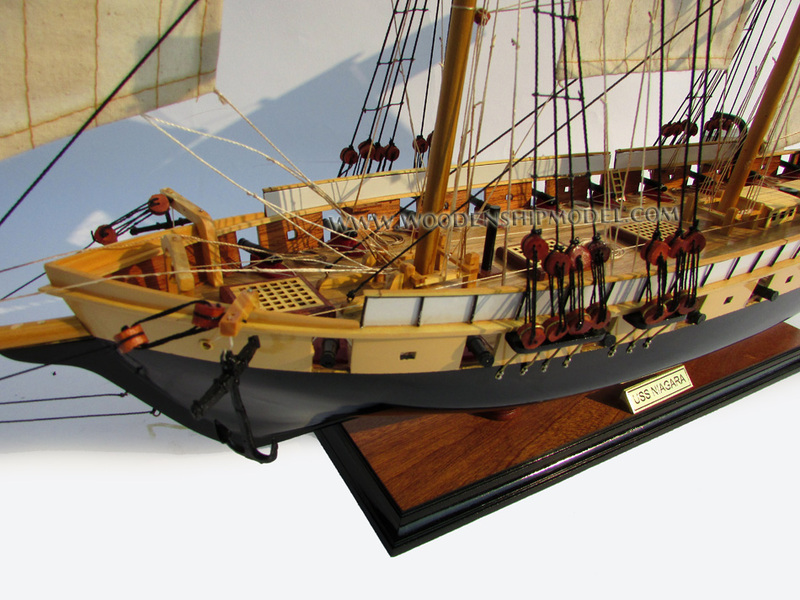 It is one of the last remaining ships from the War of 1812. The Niagara is usually docked behind the Erie Maritime Museum in downtown Erie in the U.S. state of Pennsylvania as an outdoor exhibit for the museum, but travels the Great Lakes during the summer, serving as an ambassador of Pennsylvania when not docked. It was listed on the National Register of Historic Places in 1973 and was designated the official state ship of Pennsylvania by the Pennsylvania General Assembly in 1988. The Niagara was constructed from 1812 to 1813 to protect the vulnerable American coastline on Lake Erie from the British and played a pivotal role in the battle for the lake. Along with most of warships that served in the war, the Niagara was sunk for preservation on Presque Isle in 1820. Raised in 1913, it was rebuilt for the centennial of the Battle of Lake Erie. After deteriorating, restoration of the Niagara was started again in the 1930s, but was hampered by the lack of funds caused by the Great Depression and remained uncompleted until 1963. 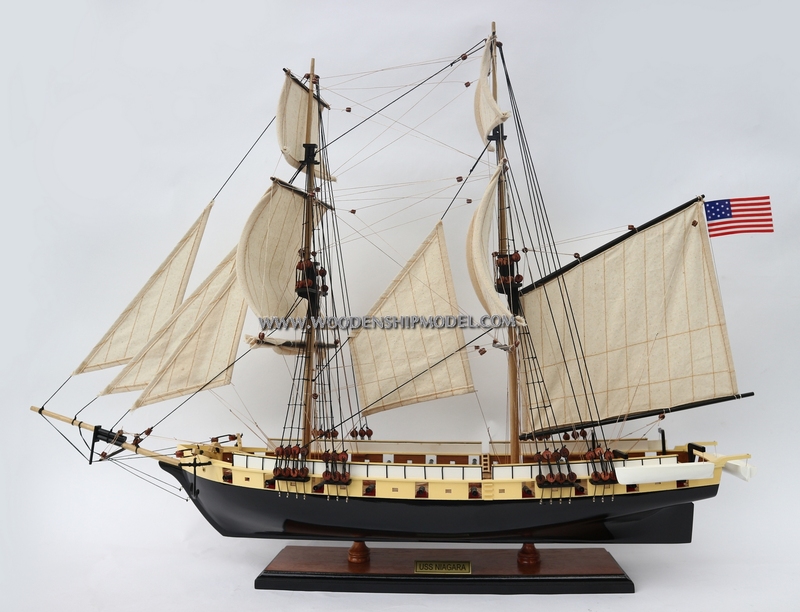 A more extensive restoration was carried out in 1988 in which much of the original ship was largely destroyed. 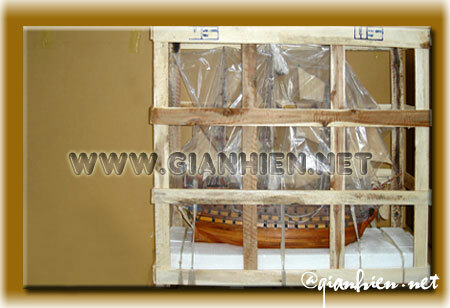 The incorporation of new materials and modern equipment makes it ambiguous as to whether it is or is not a replica. In the beginning of September 1812, Daniel Dobbins, a merchant on the Great Lakes, arrived in Washington, D.C. to warn the United States government of the vulnerability of the Lake Erie coastline to a British attack. Dobbins had been captured by the British after a surprise attack at Fort Mackinac in Michigan, but was able to negotiate his release. Dobbins was briefly detained again by the British in Detroit after the city was captured. After several days of discussions with president James Madison and Secretary of the Navy Paul Hamilton, Dobbins convinced them that the safest place to build a fleet was in the sheltered bay formed by Presque Isle at Erie, Pennsylvania. On 15 September, Hamilton authorized Dobbins to construct four gunboats. Hamilton also granted $2,000 to be used for the construction and appointed Dobbins, a civilian, to the rank of sailing master in the United States Navy. On 31 December, Captain Isaac Chauncey, the commander of naval forces on Lake Ontario, arrived in Erie for a day, made some alterations to Dobbins' ship design and authorized him to build, additionally, two brigs. Oliver Hazard Perry was promoted to Commodore in February 1813 and was given orders to report to Erie from Newport, Rhode Island. Perry arrived in Erie on 26 March, after being held up in Sackets Harbor, New York for two weeks by Chauncey in case of a possible attack by the British. 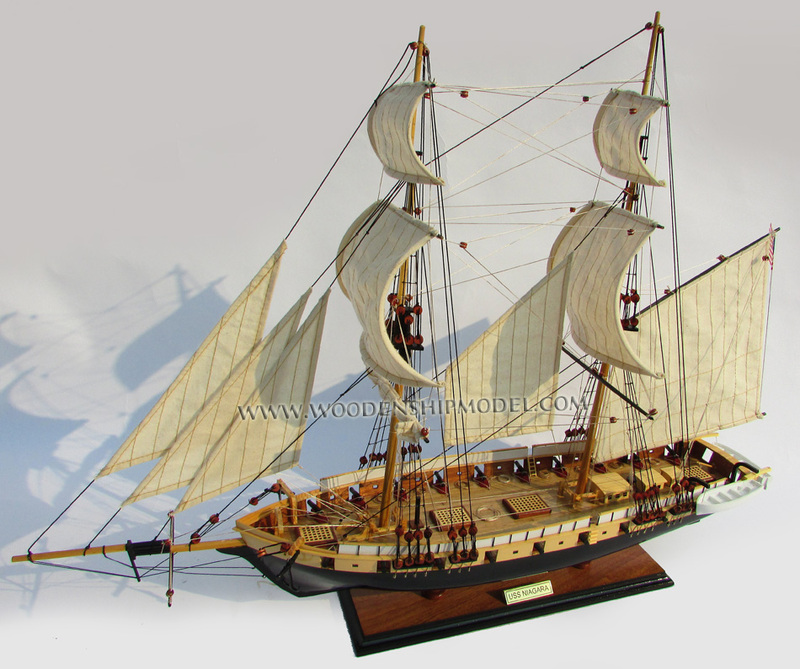 The construction of the fleet was largely supervised by Noah Brown, a shipwright brought in from New York City. 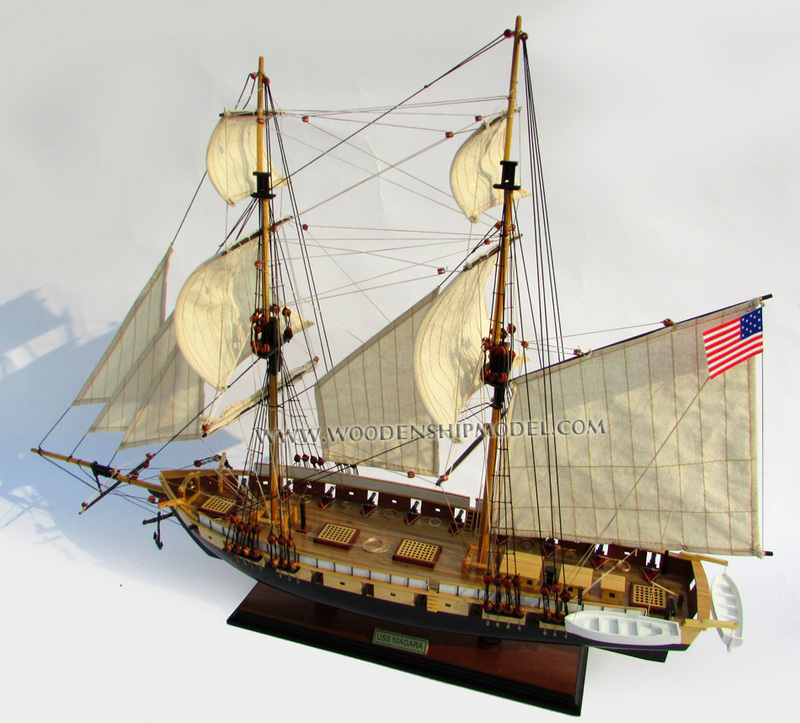 The keels of two brigs were each constructed out of a single 14-by-18-inch (360 mm � 460 mm) black oak log. 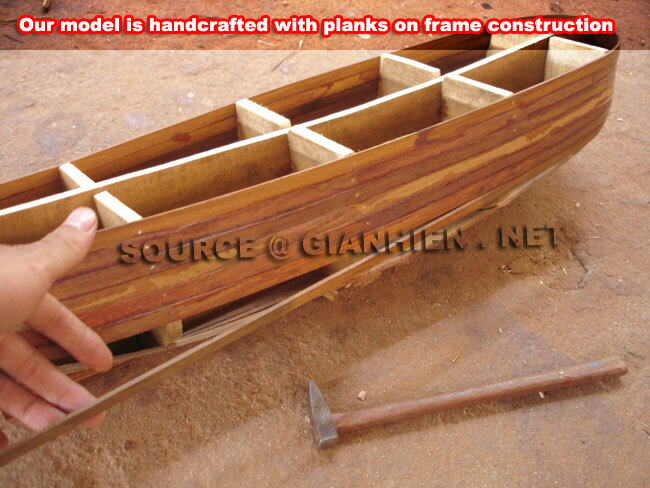 Due to a lack of iron, the timbers that made up the hulls were joined using wooden pins called treenails. 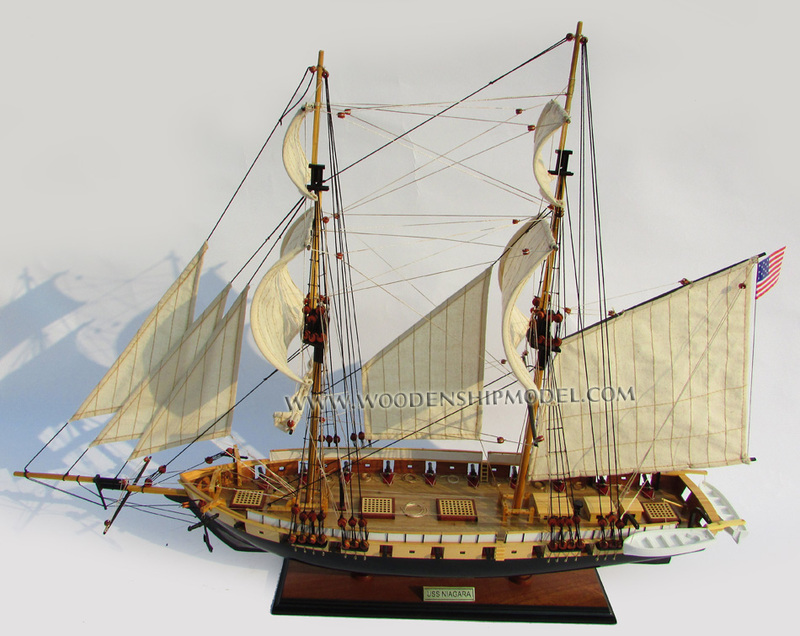 In place of the oakum and pitch normally used to caulk ships, lead was used. The timbers used in the brigs were still green, as the builders did not have the luxury of time to allow the wood to dry properly. A total of 65 cannons were shipped to Erie to arm the fleet; Hamilton approved the production of 37 cannons by a foundry in Washington, D.C. and the rest were moved from Sackets Harbor. 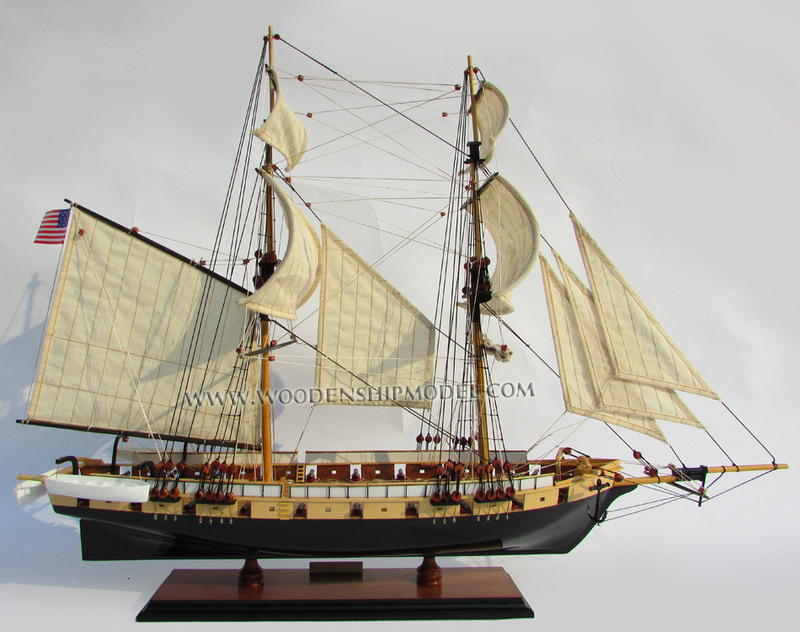 The Tigress and the Porcupine were launched in April 1813, the Scorpion in May, and the brig Lawrence on 25 June. The Niagara was launched on 4 July along with the Ariel. On 6 August, Perry ordered a shakedown cruise of the fleet, now totaling ten after the inclusion of three merchant vessels�the Somers, the Trippe and the Ohio�that were converted into warships and the Caledonia, which was captured from the British. 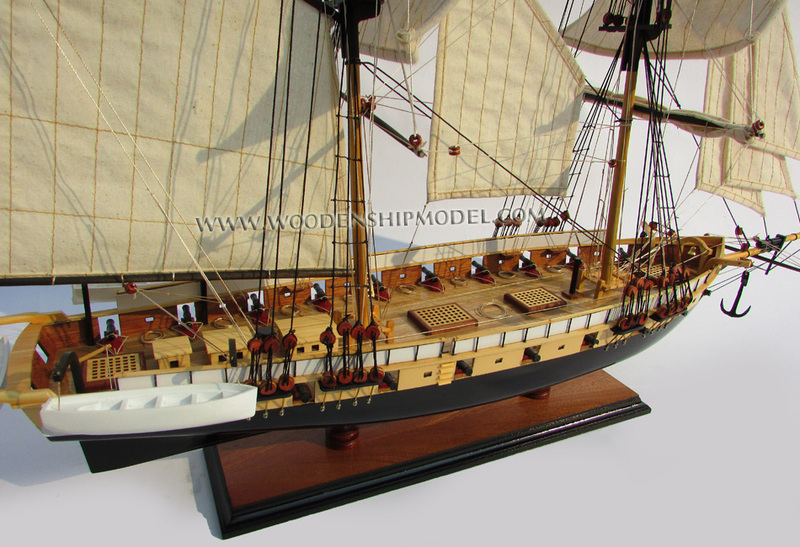 Lieutenant Daniel Turner was placed in command of the Niagara for the cruise, as the fleet was still seriously undermanned; Dobbins had even written a letter, directed to Secretary Hamilton, out of desperation back in December 1812. Word arrived on 8 August that Jesse Elliott was en route to Erie from Black Rock, New York with 89 men. Elliott was promoted to commodore and given command of the Niagara after arriving in Erie on 10 August. On 17 August, Perry's fleet anchored off of Sandusky, Ohio, and dispatched a boat to inform General William Henry Harrison of their presence. Harrison and his staff met with Perry aboard the ships the next day and agreed to a rendezvous in Put-in-Bay. In Put-in-Bay, Harrison made available 100 "Kentucky and frontier riflemen" to serve on board as Marines. Before the fleet made a stopover at Fort Amherstburg, Canada to gather intelligence, where the British fleet, under the command of Commodore Robert Heriot Barclay, was based. While Perry's fleet was under construction, Barclay had ordered the construction of the HMS Detroit, which was to be a match for the Niagara and the Lawrence. Unbeknownst to Perry, supplies in Fort Amherstburg were running out, as his fleet had cut off shipments from Long Point. Fearing an uprising caused by a shortage of food, Barclay and his fleet set sail as soon as the Detroit was complete. On 10 September, both fleets got underway. The Detroit fired the first shot around noon, while still out of range. Perry formed the fleet into a line, with the larger ships each being assigned a target: the Lawrence to the Detroit, the Niagara to the Queen Charlotte, and the Caledonia to the Hunter. As the line moved to engage, the Niagara, under the command of Elliott, lagged behind the fleet. The cause of the failure of the Niagara to maintain formation is unknown, either deliberate on the part of Elliott, or because it was becalmed. After a couple of hours, all of the cannons on the Lawrence that were facing the British were out of commission and the brig could no longer be maneuvered. Perry lowered his battle flag, emblazoned with the last words of Captain James Lawrence, "Don't Give Up The Ship", and transferred to the still-intact Niagara via a small rowboat. Perry took command of the Niagara and crossed the British line perpendicularly in a tactic called crossing the "T". The Queen Charlotte, while attempting to prevent the Niagara from breaking through the line, collided with the Detroit and became entangled. The Niagara opened fire with both broadsides: the starboard broadside hitting the Queen Charlotte and the Detroit, and the port into the Lady Prevost. After several broadsides, the Queen Charlotte surrendered, followed shortly after by the Detroit and the rest of the British fleet. After the battle, the Niagara assisted in the transporting of Harrison's army to the mouth of the Detroit River in preparation for an invasion of southwest Ontario. On 25 April 1814, command of the Niagara was transferred to Arthur Sinclair. After repairs, the fleet�consisting of the Niagara, the Lawrence, the Caledonia, the Scorpion and the Tigress�departed Erie for Detroit. In Detroit, soldiers under the command of Colonel George Croghan embarked with the fleet, bound for Mackinac Island. The fleet arrived on 26 July and landed on 4 August. The battle was ultimately lost, with Croghan being forced to retreat back to his boats. On 13 August, the fleet arrived at the mouth of the Nottawasaga River where they attacked a blockhouse owned by the North West Company. The blockhouse was destroyed by the British, along with the schooner Nancy, to prevent their supplies from being captured. As part of celebrations for the centennial of the Battle of Lake Erie, the Niagara was raised from Misery Bay in April 1913. 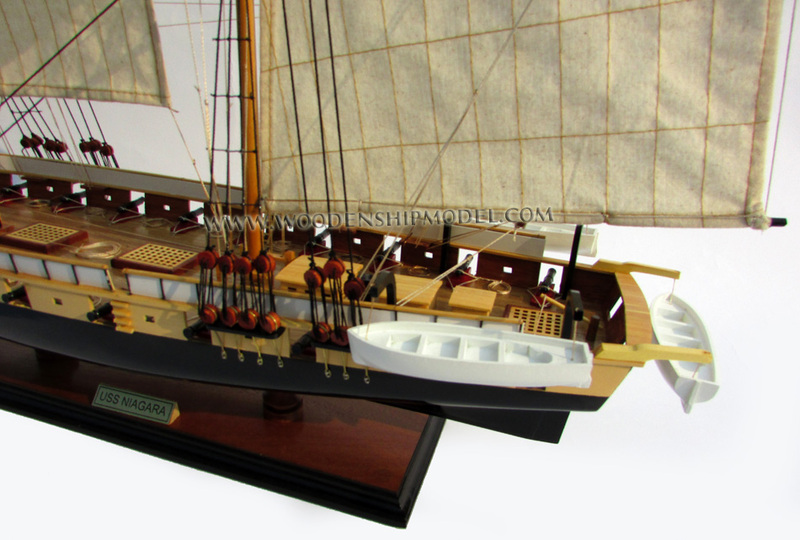 Its keel was found to be in good enough condition for the brig to be rebuilt. Efforts to rebuild the Niagara were hampered by the lack of original plans. The restored Niagara was launched on 7 June, complete with a new bowsprit, rigging and reproduction cannons supplied by the Boston Navy Yard. From mid-July to mid-September, the Niagara was towed to various ports on the Great Lakes�including Milwaukee, Chicago, Detroit, Buffalo and Cleveland�by the USS Wolverine, the Navy's first iron-hulled warship. Ownership of the Niagara was transferred to the City of Erie in 1917, where it remained docked deteriorating. The City of Erie transferred ownership of the Niagara to the newly formed "USS Niagara Foundation" in 1929, which was tasked with "acquiring and restoring the ship and making it the centerpiece of a museum." The onset of the Great Depression forced the Commonwealth of Pennsylvania to take ownership, through the Flagship Niagara Commission, two years later. $50,000 was made available for another restoration in 1931, but by 1938 the state stopped its funding, leaving the restoration unfinished. The Niagara was transferred to the Pennsylvania Historical Commission, predecessor of the Pennsylvania Historical and Museum Commission, and became a project for the Works Progress Administration. 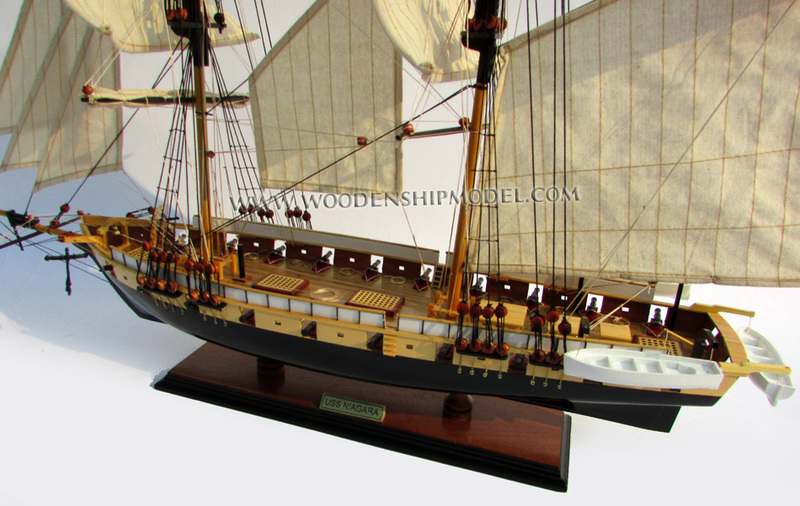 The Historical Commission contracted Howard I. Chapelle to draw up plans for another restoration of the Niagara, based on other period ships that were built by Noah Brown, like the Saratoga. According to Chapelle, very little of the original Niagara remained, as parts of it had been sold as souvenirs, and the 1913 reconstruction was not accurate to the period. The hull of the Niagara was launched in October 1943 without any masts, spars, or rigging. It was placed in a concrete cradle in 1951. Discovery of dry rot throughout every part of the Niagara made it clear that a complete reconstruction would eventually be needed. Funds were appropriated by the Pennsylvania Historical and Museum Commission to make the Niagara "presentable" for the sesquicentennial of the Battle of Lake Erie in 1963 with the addition of rigging and cannons. The Niagara was listed on the National Register of Historic Places on 11 April 1973. 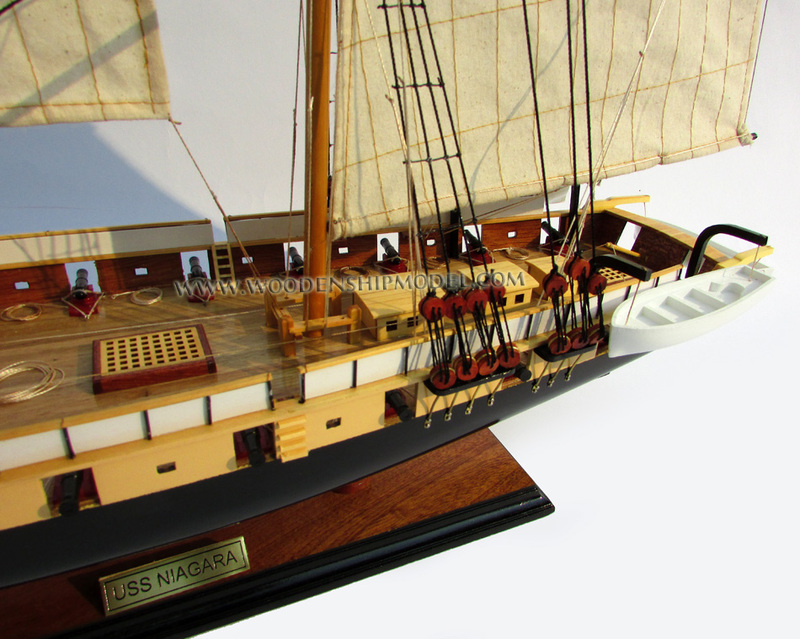 In 1981, the Flagship Niagara League was formed with intent of reconstructing the Niagara so that it would be a working ship, instead of an "outdoor museum piece". The organization was eventually incorporated a non-profit organization associated with the Pennsylvania Historical and Museum Commission. Melbourne Smith, builder of the Pride of Baltimore, was hired in 1986 by the Pennsylvania Historical and Museum Commission to head the reconstruction. The decay of the Niagara was so bad that it was dismantled and ultimately destroyed, with various timbers salvaged and used in non-structural areas of the ship. 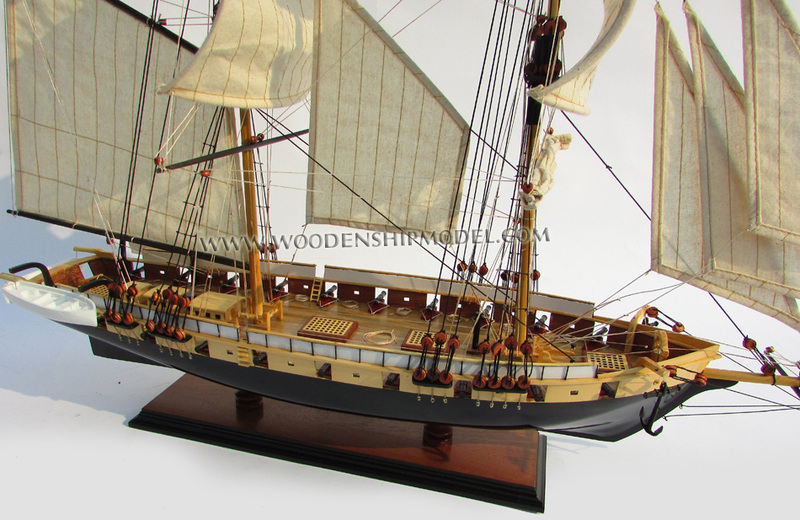 The destruction of the old ship and use of new wood often leads the Niagara to be considered a replica. While the first Niagara was built hurriedly, the new Niagara was built out of properly seasoned and preserved yellow pine and Douglas fir. The new Niagara was launched on 10 September 1988, but was not completed until 18 July 1990 when its sea trials were held. The Pennsylvania General Assembly designated the Niagara as the official flagship of Pennsylvania on 29 April 1988 and described its purpose as being a "sailing ambassador for Pennsylvania". In March 2008, the yellow pine mainmast was replaced with one of Douglas fir. 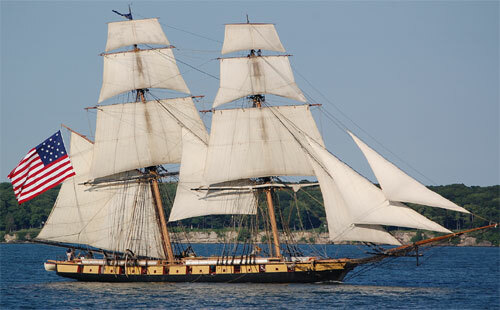 The Niagara is one of two remaining vessels that served in the War of 1812, the second being the USS Constitution. The United States Coast Guard certified the Niagara as a Sailing School Vessel in August 2005. For safety reasons, the Niagara was equipped with modern equipment such as auxiliary diesel engines, lifeboats, radar, LORAN and radio. The Niagara was also depicted on a commemorative Pennsylvania license plate. In 2009, the Flagship Niagara League assumed day-to-day management of the Niagara after a decision by the Pennsylvania Historical and Museum Commission to cut $250,000 to fill a budget deficit. 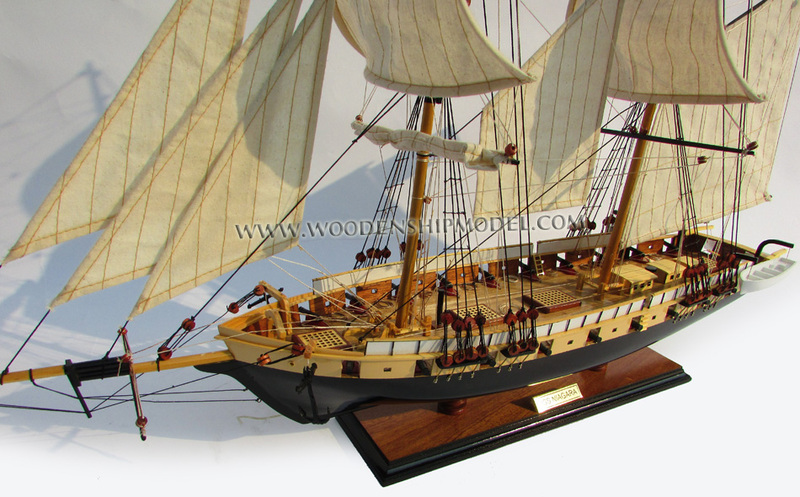 The Niagara was used to depict the whaleship Essex in an episode of the Public Broadcasting Service documentary series American Experience. As part of the bicentennial of the Battle of Lake Erie, the Niagara took part in a reenactment of the battle on September 2, 2013 in Put-In-Bay along with 16 other tall ships.